Roger is recruited at the funeral of an old military buddy to do some dirty work for the government. This provides the movie an opportunity to clue us in on the fact that Roger is officially dead due to him and his really dead buddy going back to Nam and pulling that crazy POW rescue scheme. That could theoretically follow from the first Cobra Mission. 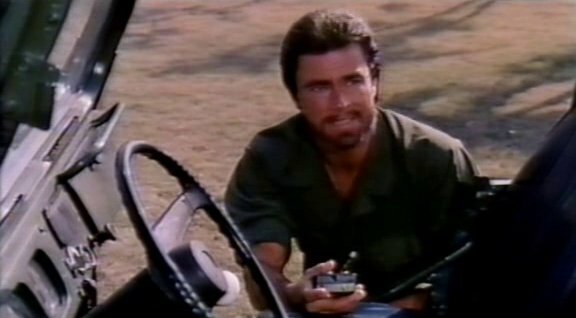 Except that in Cobra Mission there were four guys and none of them was this funny looking Roger with the wimpy dubbed voice. There was a Roger in the first movie played by Christopher Connelly, but this Roger is no Christopher Connelly. And I don’t think I have to tell you what that means. None of this would really matter all that much if the new Roger was headed back to Vietnam to bust some more of our boys out of their tiger cages. It’s not like I’m inflexible in these things. 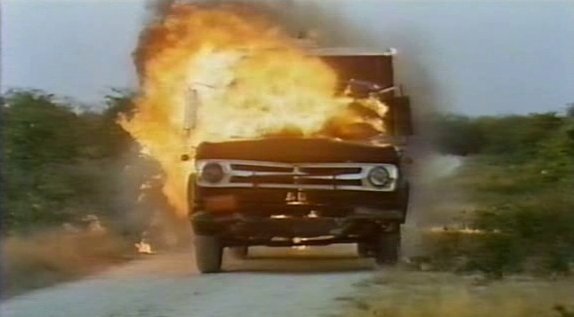 To its credit, Cobra Mission 2 does honor the spirit of its predecessor by maintaining long boring stretches where people talk about plans, drive around, and generally do anything other than blowing crap up and murdering people. All of which was easily forgiven in the first movie because we were paid off with POW rescues, tons of violence, and stupefying double crosses. 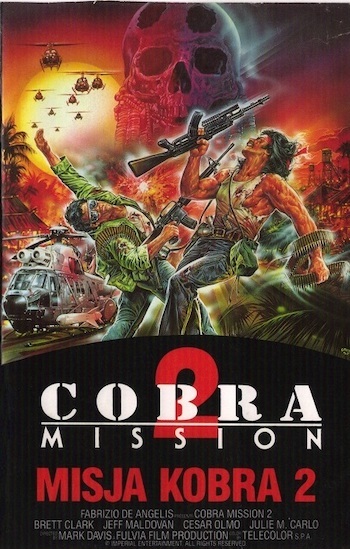 Cobra Mission 2 dials down the violence and while there are the double crosses all of us enjoy watching since they aren’t happening to us, none of them has much impact since Roger is nowhere near the Nam. It’s a law of movie making as old as this crazy moving picture biz itself – if you’re going on a mission that involves bringing all our boys home, you get a free pass on whatever 75 minutes worth of padded tripe you need to give us before we see the evil POW camp commandant get blown into ten trillion pieces by our sneering hero. If you think about it, there isn’t any better scene in film than the one where our hero is waving all the bedraggled, skinny, unshaven, filthy, stinking POWs to safety while hefting and periodically firing some monstrous gun into the heartless guts of those commie scum who are trying to destroy this freaking awesome country. Doesn’t matter whether his name is John Rambo, James Braddock, or Roger from Cobra Mission. So I’m not sure where director Camillio Teti’s head was at when he shot this movie about Roger going down to some rinky-dink country and participating in a plot to kill the evil dictator Garcia. This kind of stuff goes on in the real world and I’m not interested in it. Why would Camillio think anyone would want to sit through a bargain basement hour and half of this stuff? Frankly, I expected better from the producer of Exterminators of the Year 3000. 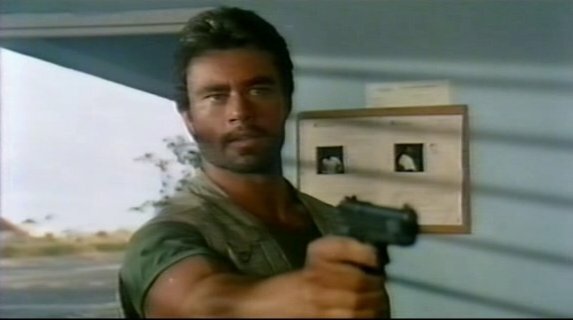 I suppose the real blame should go to writers Gianfranco Clerici and Vincenzo Mannino as well as producer Fabrizio De Angelis who collaborated on the first Cobra Mission. Come on guys, you had four years after Cobra Mission to work on this and all you came up with was a dictator named Garcia and a rebel leader named Rafael? To his credit, Roger is an interesting screen presence. With his somewhat jacked up physique, immovable hair and ten o’clock shadow, he would be right at home in a Hercules movie. And he has the lack of personality to match. But that’s really what you want in a mercenary, isn’t it? You don’t need some guy who’s going to get all worked up when rebels are accusing each other of being traitors and killing each other or when your coup d’atat goes belly up and everyone in your revolution gets killed or captured. He doesn’t even break a sweat when he finds out that rebel leader Rafael has been taken prisoner. He just starts filling up his duffel bag with grenades and sticks of dynamite! Roger also doesn’t seem to be overly flummoxed when the first coup attempt fails, though he does complain that they only managed to kill a general and a minister who Garcia wanted out of the way anyway. He also doesn’t let himself get too down when he rescues Rafael from prison and manages to get about 20 political prisoners killed in the process. In fact, he just uses that as fuel to go forward with the so-crazy-it’s-suicide-just-to-think-about-it scheme to take down Garcia once and for all. At least Camillio hasn’t abandoned all common sense as he saves the best for last with the final assault on Garcia’s old Spanish fortress that is serving as his headquarters. Roger is ducking, diving, rolling around, commandeering jeeps, and driving with one hand while mowing down wave after wave of guards with the other. While Roger’s lackadaisical detonation of the bomb he stashed on board Garcia’s helicopter that comes complete with body flopping in the air will no doubt be mentioned as a highlight by many fans of the Cobra Mission mythos, another moment manages to capture the flavor of this movie in microcosm. It’s when Garcia has Roger surrounded by about fifty soldiers and he and Roger get into an argument about which one of them has ten minutes to live! You don’t usually see that in your final showdowns between ruthless dictator and badly dubbed killing machine, but it’s all about machismo in that part of the world! This one doesn’t live up to its predecessor, but if you’re the kind of person who somehow ends up with a copy of this movie in your possession, you really can’t by definition be disappointed in it.